The Cliffside cabin boasts one large open floor plan with a full kitchen, raised bed area with a living and dining area. This is a private and cozy cabin. Enjoy the view of the White River from your 8' x 24' covered back deck. Fishing, boating, shopping and great area restaurants are all just minutes away. Art was helpful in recommending a fishing guide on short notice and we had a great fishing trip on the White River. Very clean, affordable cabins. Great views and great location! Amy was friendly and helpful. Experienced no problems with our stay. Exactly as pictured on your website. Cabin was clean, comfortable, view was beautiful. Especially appreciate that neither the cabin nor the towels and linens were cleaned with highly fragranced cleaners because I'm very sensitive to fragrance. Our stay was enjoyable! The view from the deck of the Cliffside cabin Is worth the price. Art and Amy are so nice and accommodating! White River Cabins are so lovely! Amy and Art were friendly and helpful and wonderful hosts. 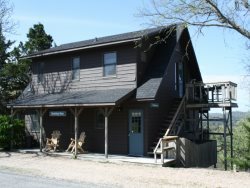 The property and cabin are very clean and welcoming! The view is incredible and it is the perfect place to getaway and relax.